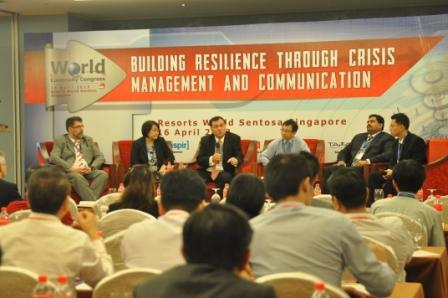 Singapore, 16 April 2013 – BCM Institute drew more than 200 senior business continuity and disaster recovery professionals from all over the Asia to gather for an annual World Continuity Congress Singapore 2013, themed “Building Resilience Through Crisis Management & Communication” at Resorts World Convention Centre. 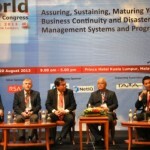 This year’s conference featured speakers who engaged delegates with a variety of topics within Business Continuity Management, Disaster Recovery and Crisis Management including Pulau Bukom Fire (Case Study), Aligning Risk Management and Business Continuity Management, The wisdom of the masses, Preparing for The Next Pandemic, Crisis Management in the Supply Chain Industry and others. In panel discussions and interactive discussions the delegates focused on the Challenges and Opportunities for Business Continuity, Crisis and Risk Management in Today’s Business Environment and discussed in depth on forward-thinking solutions for tail risks, communication, reputation loss, current economic drivers affecting business continuity, and regulatory reforms of standards and legislation. Delegates took the opportunity to interact and discuss in an open and forthright manner. In the WCC SG 2013, delegates took the opportunity to visit exhibition booths, which offered a variety of BC, DR & CM related products and services.We recorded an increase in the overall quality of the event, meeting most of the expectations of the exhibitors, visitors and organizers. The 13th WCC played an integral part in bringing together premier supporting sponsors, and provided a rich platform for networking and sharing of ideas. 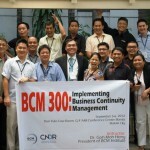 With participation from nine different organizations, the event attracted an approximate total of 200 visitors and showcased some of the latest BCM services and products on a single platform. We would like to thank our sponsors, exhibitors and participants for your on-going support and contributions to the success of WCC SG 2013!